The Consumer Federation of America is recognizing electric cooperatives and public power for leading the way on community solar projects. In a new report, CFA says those projects will ultimately pay off through economies of scale and long-term rate stability. “The greater interest of rural electric co-ops and public power systems largely reflects strong interest and participation of their residential customers, who also have the final say in investment decisions,” said Steve Brobeck, CFA executive director and author of the report. Photo by the Lake Region Electric Co-op, which built its first community solar array in 2013. It sold out quickly. 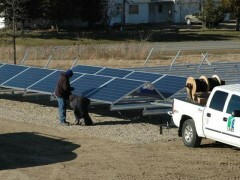 This entry was posted in Community-Scale Solar, NewsBlog and tagged Electric Co-op Today (ECT), National Rural Electric Cooperative Association (NRECA), Nebraskans for Solar, rural electric cooperatives' community solar development, The Consumer Federation of America on May 11, 2016 by Helen Deffenbacher.